Did you know that video is the fastest growing type of content on LinkedIn? And that’s not all, LinkedIn shared with us that it’s also the type of content most likely to drive conversations on the platform. If you’re interested in getting started with video on LinkedIn but aren’t sure where to start, this is the guide for you. We’ll dive into everything from the benefits of using video on LinkedIn to video ideas, best practices, and some step-by-step instructions on how to actually upload videos to the professional social network. Click the links in the table of contents to jump directly to a specific section, or read through for an overview of all things LinkedIn video. We’ll start things off with a quick look at why LinkedIn is a great place to market your B2B business, in general. Candace Kim, LinkedIn Senior Product Marketing Manager, shared with us, "First and foremost, it’s our audience. We have the world’s largest professional audience." LinkedIn is the place for businesses to connect with professionals. With an audience over 610 million professionals worldwide, LinkedIn offers a unique opportunity for marketers to reach decision-makers, thought leaders, and executives on a platform where they’re ready to engage with and consume professional content. This audience has 2X the buying power of average web audiences. 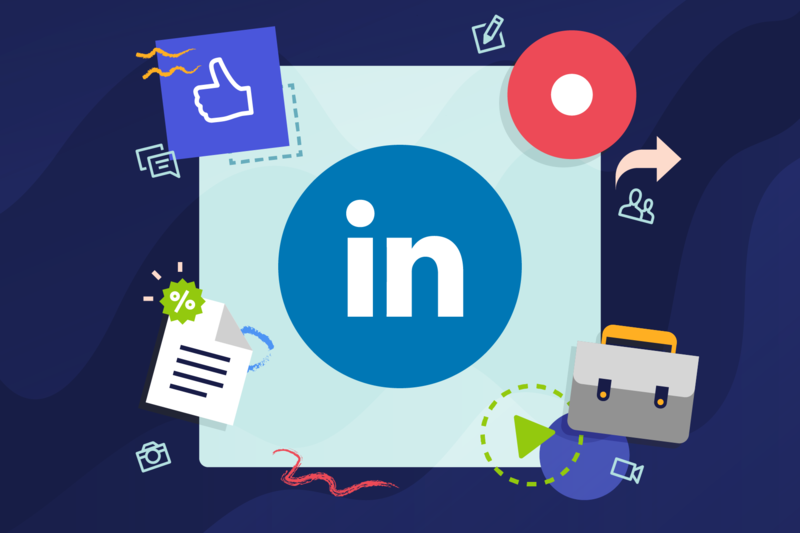 And LinkedIn Marketing Solutions aims to help businesses reach the right professionals and maximize results through B2B advertising products aimed at creating and expanding relationships between businesses and professionals. As we mentioned in the introduction to this guide, video is the fastest growing type of content on LinkedIn, and it’s also the type of content most likely to drive conversations. But that’s not all. The LinkedIn team shared with us that members on the professional network spend nearly 3X more time watching video ads compared to the time they spend with static Sponsored Content. Millions of people have already created and shared videos on LinkedIn. And in a recent article on the Animoto blog, we shared 3 reasons you should be using video on LinkedIn, in collaboration with the LinkedIn team. Convinced you should be using video on LinkedIn but not sure what videos to make? In this section we’ll share some ideas for using video on LinkedIn. We’ll share ideas for videos that you can use to market your business, showcase your thought leadership, or for recruiting. If you run a business targeting other businesses or business professionals (B2B), then LinkedIn offers an incredible marketing opportunity. As we mentioned earlier, LinkedIn is teeming with professionals and decision-makers looking for products and tools that can help their businesses. Senior Product Marketing Manager, Candace Kim, says, "video allows our marketers to tell rich stories about their product and brand to these engaged audiences." Here’s a template that can be used to create a video marketing a new product launch. Notice that it starts with a statement identifying a need and then dives into how the product solves for the need. LinkedIn is also a wonderful place to showcase your professional thought leadership, as a business or as an individual. You are an expert in your field, and a video in which you share that expertise is a fantastic way to build trust and make a name for yourself in your industry. One of the best ways to do this is by sharing your take on a trending news story within your industry. Join the conversation to share your perspective or explain a trend. Check out our Trending News template, created in partnership with LinkedIn, for an example. When potential new hires come to your LinkedIn business page, video can be a nice way to give them a glimpse into your company culture and values. Our Company Values template offers a mix of marketing and recruiting. You can use it to showcase what your business does while also honing in on your company values, such as moving fast and leading with design. Customize it with your own product and values. For more ideas and examples, check out our full blog post on LinkedIn business video ideas. That post contains eight video templates that you can customize today. Ready to dive in and start creating videos? We’ve pulled together some best practices to help you make the most of your LinkedIn video efforts. These best practices were gleaned from the LinkedIn Sales and Marketing Solutions EMEA blog, a LinkedIn infographic on the science of breakthrough video, as well as conversations with the LinkedIn team. We’ve talked a lot about the power of the LInkedIn audience in this guide. But in order to create video content that resonates with the audience on LinkedIn, it’s important to start by considering their needs. Before making a video, think about what audience you are creating it for. What are their needs and how can you offer them value? Create videos that will help solve a need for your audience or benefit them in some way. As a part of thinking about your audience, be sure to also consider where they are in the buyer’s journey. You can use video to enhance the experience for customers all the way at the top of the funnel, straight down to purchase. For customers as the top of the funnel, you’ll want to create videos that aren’t focused on making the sale. Rather, you’ll want to focus on brand awareness by creating videos that showcase your expertise and answer questions that potential customers might have before looking for a solution. Our Real Estate Explainer template is a good example of this type of video. It answers a question potential customers may be asking, giving you the opportunity to showcase your expertise and get your name out there. As you move down the funnel, videos that directly promote a product or aim to collect leads become more appropriate. Decide what metrics you’re aiming for and craft your video’s message accordingly. For inspiration, check out our Webinar Event Promo template. Rather than posting a link to a video on another platform, upload video to LinkedIn directly so it plays natively right in the LinkedIn feed. This’ll result in further reach and engagement. You can learn more about how to get this set up a little later on in this guide. 80 percent of LinkedIn videos are watched with the sound off. As a result, you should approach video creation with your silent film director's cap on. Videos that are designed for silent viewing are 70 percent more likely to be watched through to the end than those that aren’t. Use text or subtitles to ensure videos are easy to understand, even when watched with the sound off. All of the templates shared in this guide were built not only to be easy to understand without sound, but also to be mobile-friendly. Mobile-friendly videos keep text short and large so it’s easy to digest on small mobile screens. Don’t forget to provide a clear CTA to let viewers know what you want them to do next. Do you want them to visit a webpage? Sign up for a newsletter? Watch another video? Make a purchase? Be sure to include the CTA in your video or accompanying copy that summarizes your video. And don’t forget to include any necessary links providing more information. This is a good spot to note that, when you share a video on LinkedIn, you’ll also include a headline and description copy. And research shows that the video’s headline and summary content are even more influential than the video’s cover image. So take some time to ensure that this copy makes it clear what viewers will get out of your video and what next step you’d like them to take. LinkedIn recommends optimizing video length based on your objective. In a guide on video ad tips, they share that you should "keep videos under 30 seconds for brand awareness and brand consideration goals. A study by LinkedIn found that videos under 30 seconds reported a 200% lift in video completion rates." In fact, the most successful video ads are less than 15 seconds long. They recommend testing longer videos for demand generation. Longer form content is ideal for telling more complex stories, and can help with driving clicks and views related to generating leads for educational content. To learn even more, check out our full blog post on LinkedIn best practices for video. LinkedIn’s also got a great LinkedIn Video Ad Tips eBook that we recommend checking out. Video ads created with a 1:1 aspect ratio should have a minimum resolution of 600 x 600, and a maximum resolution of 1080 x 1080. Once you’ve created your first LinkedIn video you’re ready to share it! In this section, we’ll show you how. You can upload a video to your LinkedIn profile, LinkedIn page, or run it as a video ad. We’ll share the step-by-step instructions for how to do all three. We’ll start with a quick rundown of how to post a video on your personal LinkedIn profile. Create a new video post. Simply click on the video icon. Upload your video. Find the file on your computer and select to upload. Set your audience. You can choose to show your video to anyone, or a specific audience or group you belong to. Add a description. Include a description with more information about your video. You can also include hashtags to help people find your video. Post. Click on the “Post” button. Your video will appear after it’s done processing. Note: You can also upload videos using the LinkedIn app. When you do, you’ll also have the option to add stickers and text. Sharing a video to a LinkedIn business page is similar to sharing to your personal profile. You’ll just want to head over to the actual business page to get started. Create a new video post. To do this, click on the video icon in the box that says "Share an article, photo, video, document, or idea." Upload your video. Choose the video you want to upload. Select your audience. Choose "Public" to show your video to everyone, or select a "Targeted audience." Targeted audiences are a feature of LinkedIn advertising, which we’ll get to in the next section. Add a description. Add a description with more information about your video and any relevant links. Post. Click the “Post” button. Your video will appear after it’s done processing. Setting up an ad requires a bit more of a guide than uploading a video organically. We’ll dive into the basic steps here, but check out our guide to getting started with LinkedIn ads for the full run down. We’ll be showing you how to use LinkedIn’s Objective-Based campaign experience. Set up your account. Make sure you’ve got the appropriate permissions enabled, that your billing info is correct, and that you’ve got a business page associated with your account. Create your campaign. Head over to the LinkedIn Campaign Manager and click on the Create Campaign button to get started. Set your campaign objective. Choose a goal. You'll find goals related to awareness, consideration, and conversions. Set your audience. Choose the audience you'd like to target. You can target based on language, location, education, job experience, and more. Set up a video ad. When you’re given the option for Ad Format, choose "Video Ad." Set your budget. Choose a budget and schedule to indicate how much you’d like to spend and how long you’d like your video ad to run. Create your ad. Add the video, description, and relevant CTA and you’re good to go! Once you’re done, just click Create. Ready to get started with LinkedIn video? We're here to help! An Animoto subscription gives you everything you need to drag and drop your way to powerful and professional marketing videos. Customizable video templates, including six templates designed specifically with LinkedIn success in mind, make it easy to create your own videos in minutes. With over a decade in the industry and a partnership with LinkedIn, Animoto is used by more than 1 million businesses worldwide. Try it for free today or learn more about using Animoto for LinkedIn videos. Happy video making!